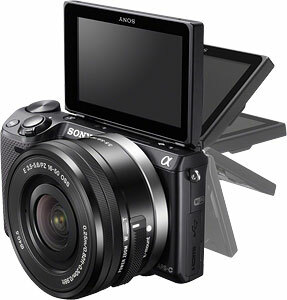 In late 2012, Sony brought its NEX mirrorless camera series into the hybrid autofocus age, with the debut of the NEX-5R. Just ten months later, that camera gets a more modest refresh, with the arrival of the Sony NEX-5T. The NEX-5T will be of interest to photographers using certain smart devices -- be they phones or tablets -- running the Android, Blackberry, Symbian and Windows Phone operating systems. That's because it now includes a short-range Near Field Communications radio, used to simplify the process of creating a longer-range, high-speed Wi-Fi connection with compatible devices. To pair your device without any intervention, you simply enable NFC (or leave it enabled at all times; power consumption is very low thanks to its short range), and then hold the smart device next to the NFC logo on the camera body. Photographers who have a preference for Apple gear will, sadly, not get to join in. They'll have to pair the old-fashioned way, which will take a little more time, but will only really be an inconvenience if you regularly pair new devices. This is all because Apple has so far resisted adding NFC to its products. It shows no signs of backing down, despite a profusion of NFC-compatible gadget launches over the last year. Beyond the new NFC radio, there's only one other change of note: the NEX-5T ships with a different kit lens in its product bundle. Where the NEX-5R came with an E 18-55mm F3.5-5.6 OSS lens (the SEL1855), the NEX-5T will include the E 16-50mm F3.5-5.6 PZ OSS lens (model number SELP1650). The new optic is still stabilized, but performed better in testing at our sister site, SLRgear.com, and is significantly lighter and smaller thanks to a retractable design, so we see this as a far better pairing. Be aware, though, that you'll get just a touch less telephoto reach, in exchange for better wide-angle coverage. Available from early September 2013, the Sony Alpha NEX-5T carries a list price of US$700 including the 16-50mm kit lens. That's just US$50 more than list pricing of its predecessor, a pretty good deal considering the better lens and added NFC radio. Body-only price is about US$550. Let's take a tour of the new model. A trip around the Sony NEX-5T is a very familiar affair indeed. Short of the silk-screened model number on the top deck and one logo elsewhere -- we'll come back to that in a moment -- there is literally no way to tell the new body apart from that of the earlier NEX-5R. Seen from the front, not only is the NEX-5T identical to the NEX-5R, but the basic layout is little-changed from the earlier NEX-5N. The lens mount dominates, extending slightly beyond top and bottom of the camera body, and in the process emphasizing how Sony has pared every possible fraction of an inch from the design. Below and to the right of the lens (as seen from the rear), the lens release button peeks out. An oval, infrared remote receiver hides in the trim at the top of the handgrip, and alongside it sits an autofocus assist lamp. Move to the top, and you can finally identify the camera -- but only thanks to the model number. (And only when looking from behind the lens, since the branding sits along a bevel between the top and rear decks.) Otherwise, nothing here has changed: the Smart Accessory Terminal 2 sits directly above the lens mount, straddled by two ports for the stereo microphone. Behind these are two rubber stoppers against which the LCD presses when flipped all the way up for viewing from in front of the camera. When the LCD is fully raised, the Smart Accessory Terminal 2 can't be accessed, incidentally. All top deck controls -- the Shutter, Function, Playback and Movie record buttons, Power lever, and one of the two control dials -- sit in a cluster at the rightmost end of the body. From the rear, you can again see the model number, but if you cover that, there's nothing else to tip you off to which camera you're looking at. The articulated LCD dominates most of the NEX-5T's rear, and the standard NEX-series button layout -- three soft buttons and a combined Four-way controller / control dial -- are grouped to its right. There's also a small thumb grip at top right. The left end of the NEX-5T body is unchanged. On the left are a Wi-Fi logo, and an access panel covering the HDMI and USB ports. The right side of the body is home to the only other minor difference: a small NFC logo sits in the center of the handgrip. (Unfortunately, we don't have a great image of it, but you can just see it peeking around the edge in the press image above.) Hold your Near Field Communications-compatible phone or tablet near this logo, and it should automatically pair with the camera's Wi-Fi, with no intervention beyond enabling the smart device's NFC radio, if necessary. And finally, we come to the base of the camera, which is again unchanged. Beneath the handgrip is a door concealing the combined battery / flash card compartment. A small cutout at the rear of this door provides ingress for a cable that attaches the optional AC adapter kit to a dummy battery in the camera body. A metal tripod socket sits neatly on the central axis of the lens, nicely positioned for panorama shooting. In between is a three-hole grille for the camera's speaker. When it comes to the in-hand experience, there's not a lot to distinguish the new NEX-5T from the previous NEX-5R. As noted above, about the only difference between the NEX-5T and the earlier 5R is that the new model sports improved Wi-Fi capability, using NFC (near-field communications) technology to automate the pairing of the camera with your smart device. All that's required to set up the connection with a smart device running Sony's app is to touch the two devices to each other for a few seconds. The app will recognize the device, connect to it, and then let you exercise a surprising amount of control over the camera, and seamlessly download images from it for sharing on a variety of social media, or just storage on your smart device. The fact that the user interface and body design is so similar to the 5R is no shortcoming: The NEX-5 series has from the outset been an extremely high-functioning line of cameras, and the NEX-5T follows soundly in those footsteps. While the initial NEX-5 had some frustrating UI rough spots, they've been almost entirely smoothed out in the intervening time, and the current interface is pretty pleasant to use, while being largely understandable to non-geeks. Our final verdict will of course await our lab tests of a production sample, but if the NEX-5T follows its predecessors' examples, it'll be a fine camera, now with the added utility of NFC-enabled WiFi for smart device connectivity. Sensor. 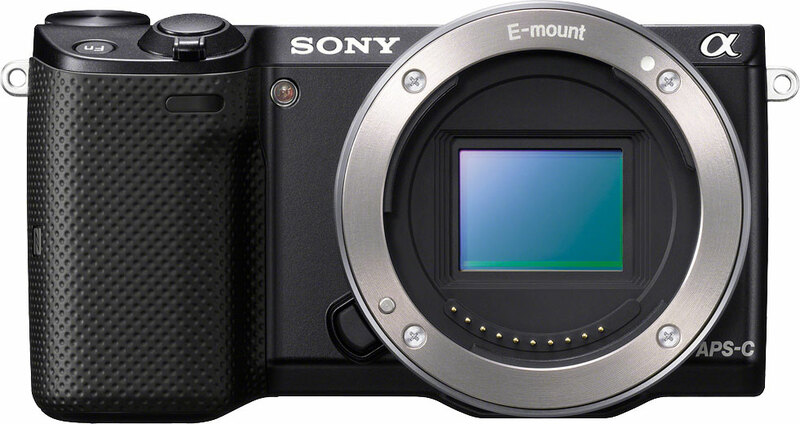 At the heart of the Sony NEX-5T sits the same Exmor APS HD CMOS image sensor seen previously in the NEX-5R. Resolution is about 16.1 megapixels effective, from a total of 16.7 megapixels. The APS-C sized sensor has an RGBG color filter array, and a 1.5x focal length crop. Performance. Data from the NEX-5T's image sensor is handled by Sony's proprietary BIONZ-branded image processor. Like the NEX-5R before it, the NEX-5T defaults to a rather sedate three frames per second for burst shooting. In the Speed Priority Continuous mode, though, you'll manage a much swifter 10 fps. Focusing. How's that speed achieved? It comes thanks to on-chip phase detection autofocus. The Sony NEX-5T includes a Fast Hybrid-branded autofocus system that uses on-chip PDAF to get in the ballpark, and follows up with contrast detection AF for fine tuning. In Speed Priority mode, the latter step is skipped, and only the phase detection AF operates. The result is a lot faster shooting, but an increased likelihood of focus errors. Sony's on-chip PDAF implementation features a generous 99 autofocus points in a cluster at the center of the image frame. Contrast detection, meanwhile, works with 25 areas. Fast Hybrid AF requires a compatible lens. If not supported, the NEX-5T uses contrast detection alone. You can, of course, still focus manually. Both focus-peaking and magnifier functions are available. Sensitivity. The NEX-5T's sensor and processor pairing allow a sensitivity range of ISO 100 to 25,600 equivalents. In movie mode, the upper limit is reduced to ISO 6400 equivalent. Auto ISO ranges to ISO 3200 max. for both stills and movies. Lens mount. Like other NEX-series cameras, the NEX-5T's lens mount accepts only Sony E-mount lenses directly, but can be used with an unusually wide range of non-native lenses via mount adapters provided by Sony and third parties. Currently, Sony offers 13 E-mount lenses, with two more soon to arrive. All but two of these -- the E 16mm f/2.8 and E 20mm f/2.8 primes -- support the Hybrid AF system. You can of course still use these remaining two lenses, but the NEX-5T will fall back to contrast detection autofocus only. Viewfinder. Like the NEX-5R before it, the NEX-5T doesn't include a built-in viewfinder, but can accept an optional electronic viewfinder accessory that mounts in the Smart Terminal 2 on the top of the camera body. The optional FDA-EV1S electronic viewfinder is based around a high-resolution Organic LED panel, and has a 90-degree vertical tilt function, 100% coverage, and a very high resolution of 2359k dots. It also offers a -4.0 to +1.0m-1 diopter correction function. List pricing for this accessory is US$350. LCD. 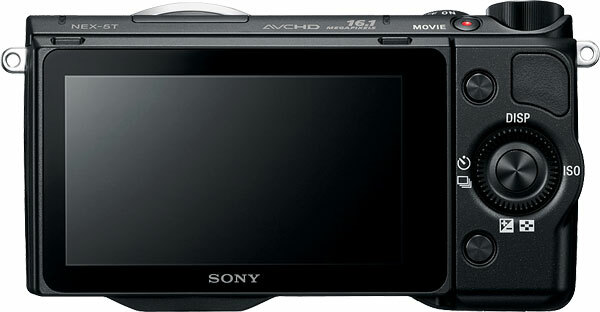 The Sony NEX-5T features an Xtra Fine-branded LCD monitor with a three-inch diagonal and VGA resolution (640 x 480 pixels; 921,600 dots). There's both an automatic/manual five-step brightness control, and a Sunny Weather mode for better outdoor visibility. Touch control. Sony has retained the touch panel from the NEX-5R, which allows you to do things like trip the shutter release from the touch panel, select an object for autofocus tracking, and control background defocus with a slider control. Articulation. 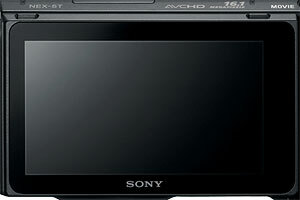 Just like that of the NEX-5R, the Sony NEX-5T's LCD monitor features an articulation mechanism. This can tilt 180 degrees upwards for self-portrait viewing, although in this position it blocks the Smart Accessory Terminal. It also tilts downward by around 50 degrees. Exposure. Shutter speeds on offer in the Sony Alpha NEX-5T range from 1/4000 to 30 seconds, plus bulb. The camera uses an electronically-controlled, vertical traverse focal plane shutter, as well as an optional electronic first curtain shutter. Exposures are metered using the image sensor, with a 1200-zone evaluative metering system. Metering modes include multi-segment, center-weighted, and spot. Flash. The Sony NEX-5T doesn't feature a built-in flash. 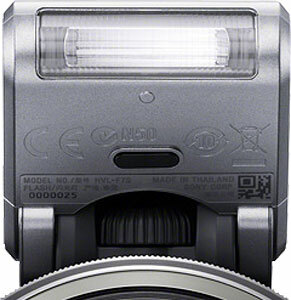 Instead it comes bundled with a small HVL-F7S fold-down flash. 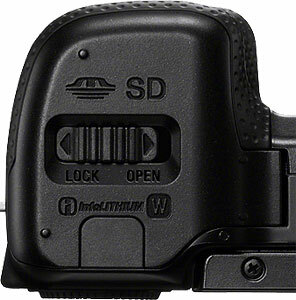 This and other compatible strobes mount in the proprietary Smart Accessory Terminal 2 connector on the top deck. When mounted, the flash obviously prevents raising the LCD panel for self-portraits. The bundled flash has a guide number of 23 feet (7m) at ISO 100. Coverage is 16mm, and the flash recycles in four seconds. Flash modes include Auto, Fill-flash, Slow-sync, and Rear-sync. A red-eye reduction function is also available, enabled or disabled through the Setup menu. X-sync is at 1/160 second, unchanged from that in earlier Sony NEX-series models. Video. The Sony Alpha NEX-5T can record Full HD (1920 x 1080 pixel; 1080p/1080i) movies at a rate of either 60 frames per second, 24 frames per second, or 60 interlaced fields per second. (In some markets, the 60p/60i rates are replaced with 50p/50i rates, and the 24p rate with 25p.) You can also opt for lower-res 1440 x 1080 and 640 x 480 movies, with a fixed rate of 30p (25p on overseas models). At the maximum resolution, movies are saved using AVCHD version 2.0 (MPEG-4 AVC / H.264) compression with AC-3 stereo Dolby Digital audio. At lower resolutions, movies are saved with MP4 compression and MPEG-4 AAC-LC stereo audio. Wireless connectivity. 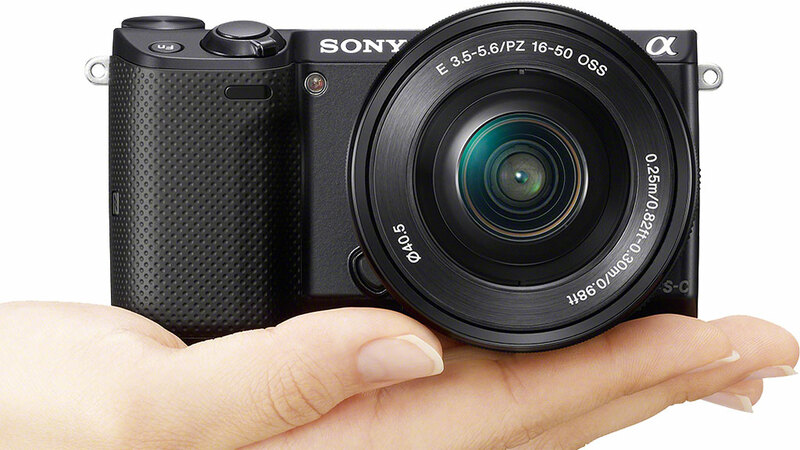 Like its predecessor, the Sony NEX-5T includes built-in Wi-Fi connectivity. However, setup of a Wi-Fi connection is now much easier -- at least, so long as you don't use an Apple smart device. That's thanks to Near Field Communications technology, which establishes a Wi-Fi connection for you automatically when you simply hold an NFC-compatible smart device such as a phone or tablet next to the NFC logo on the NEX-5T body. Unfortunately, Apple is still resisting adoption of NFC, and so many smart device owners will find they still need to establish a connection manually. Hopefully that will change, because NFC couldn't be much simpler or easier to use. On the plus side, many Android, Blackberry, Symbian and Windows Phone devices already support NFC. Wired connectivity. 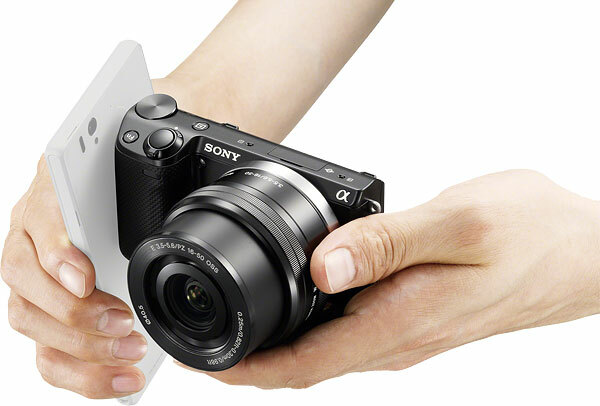 As well as its aforementioned Smart Accessory Terminal 2 and wireless connectivity, the Sony NEX-5T includes a Type-C Mini HDMI port for high-def viewing on a TV, and a Micro USB Type B port for USB 2.0 High Speed data connectivity. The latter allows charging, letting you carry one less charger if you've got other USB-charging devices. Note that the USB port is not Sony's multi-terminal, and so isn't compatible with the RM-VPR1 wired remote control. 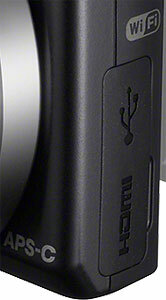 However, there's an infrared receiver in the handgrip, compatible with the RMT-DSLR1/2 remote controls. Storage. Images and movies are stored on Secure Digital cards, including the higher-capacity SDHC and SDXC types. You can alternatively use Sony's proprietary Memory Stick Duo cards in the same slot, should you prefer. Power. The Sony NEX-5T draws its power from a proprietary InfoLithium NP-FW50 lithium-ion rechargeable battery pack. 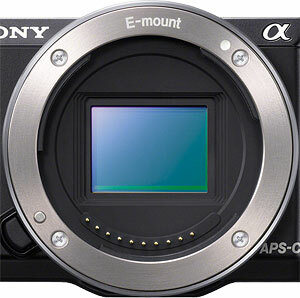 Sony rates the camera as good for 330 shots on a charge, to CIPA testing standards. Below are crops comparing the Sony NEX-5T with the Sony NEX-6, Canon SL1, Nikon D3200, Olympus E-PL5, and Panasonic G6. NOTE: These images are best quality JPEGs straight out of the camera, at default settings including noise reduction and using the camera's actual base ISO (not extended ISO settings). All cameras in this comparison were shot with our very sharp reference lenses. The comparison between the NEX-5T and its big brother the NEX-6 is very similar here at base ISO. The NEX-6 perhaps resolves fine detail in the mosaic tile and red swatch a tiny bit better, but the NEX-5T performs slightly better in the pink fabric, but we're really splitting hairs. Performance here is practically identical, as you'd expect. Again, another similar comparison. The NEX-5T and SL1 are neck and neck in the first two comparison, but the biggest difference is seen in the fabric crop. The Sony does a little better with both the red and pink fabrics, though the Canon produces a more accurate pink color. The 24-megapixel D3200 easily out-resolves the 16-megapixel NEX-5T, though the Sony's images are crisper due to more aggressive default sharpening and somewhat higher contrast. It's a mixed comparison here, as both cameras do well in different areas. The bottle crops look similar, but noise is a little higher from the E-PL5 as can be seen in the shadows. Both are pretty evenly matched in the mosaic though the Olympus looks cleaner this time, but the Sony does better with the red and pink fabrics. The first comparison here looks pretty similar in terms of the sharpness and detail. We give the Panasonic the edge in the mosaic crop, but the NEX-5T produces just a bit more contrast in the fabrics compared to the G6. Just like we saw at ISO 100, here at 1600, the two Sony cameras are practically in a dead heat. Noise and detail look nearly identical, though the 5T does slightly better with the pink fabric yet again. The noise levels here in the shadows of the first crop comparison look similar, but after that the NEX-5T takes the lead with crisper detail in the mosaic crops. Both cameras struggle with the red and pink fabrics, though the Sony does noticeably better here. While the D3200 continues to out-resolve the NEX-5T, the Sony's more aggressive processing produces cleaner, clearer images compared to Nikon's more conservative approach. Overall, the NEX-5T comes out on top here in this comparison with fewer noise reduction artifacts, which you can see in the E-PL5 bottle crop. The NEX-5T also does slightly better in the mosaic, whereas the E-PL5's noise reduction creates a slightly mottled look. The NEX-5T also does just a bit better with the red leaf pattern, but the E-PL5 manages to show hints of threads in the pink fabric. A tough comparison. While both show fairly low noise in the first crop comparison, the NEX-5T shows crisper detail in the mosaic crop, but the pink fabric looks slightly better in the G6 crop. Again, like the previous comparisons of these two cameras, they look quite similar here at ISO 3200. There's noticeable noise in the shadows in the first crops, but there's still a lot of fine detail, with the mosaic pattern still visible. The red fabric is equally mushy and the pink fabric has taken on a splotchy look. The first two crop comparisons between these two cameras look roughly similar in terms of noise and fine detail (though the Sony looks just a hair better in the mosaic). The biggest difference is with the fabric, with which the SL1 really struggles -- there's almost no leaf pattern in the red fabric. While the NEX-5T is not great with the red fabric either, it at least shows more of a semblance to the leaf pattern. The Sony is the clear winner here, with much less luminance noise and crisper detail overall. The Nikon displays some obvious chroma noise in the bottle and mosaic crops, and both cameras struggle with the red fabric. The E-PL5 here produces a clearer image overall, but the NEX-5T is better able to reproduce some form of leaf pattern in the red fabric. The E-PL5's processing creates a slightly peppered effect in the mosaic, whereas the NEX-5T simply lacks crisp detail. The Panasonic displays higher luma and chroma noise, and when combined with sharpening artifacts, its images start to take on a stippled effect. While the winner for the bottle and mosaic crops goes to the NEX-5T with cleaner, crisper detail, both cameras have trouble with the red-leaf fabric. Detail comparison. The Sony NEX-5T does a good job with fine, high contrast detail, but the winner at base ISO is clearly the Olympus E-PL5, with the G6 and SL1 coming in as runners-up. The D3200 shows excellent detail, but contrast and sharpness are a little low compared to the others, while both Sonys show some false colors within fine lines of the lettering. At the higher ISOs, the NEX-5T is a strong competitor, with lots of fine detail and good contrast compared to many of the other cameras; particularly holding up nicely against the E-PL5. The D3200, and to a lesser extent the SL1, really show a drop in fine detail and contrast at ISO 6400 compared to the others. Overall, there's not a lot of difference between the NEX-5T and the NEX-6, apart from minor differences in contrast and exposure. Excellent 24 x 36 inch prints at ISOs 100 and 200; a nice 13 x 19 at ISO 1600; and a good 4 x 6 at ISO 12,800. ISOs 100 and 200 produce excellent 24 x 36 inch prints with rich, accurate colors and sharp detail. Also capable of very nice wall display prints up to 36 x 48 inches. ISO 400 prints are quite good at 20 x 30 inches, again showing nice detail with the exception of typical softening in our difficult red swatch. Wall display prints are possible here up to 30 x 40 inches. ISO 800 images look good at 16 x 20, which is a relatively large size for the ISO. There is minor noise apparent in flatter areas of our target, but it still makes a nice print. ISO 1600 prints are good at 13 x 19 inches. At 16 x 20 there is too much noise in shadowy areas to make our "good" grade, but this size may work for less critical applications. ISO 3200 shows a sharp decline in image quality at least at default JPEG noise reduction settings, and warrants a print size reduction to 8 x 10 inches, as anything larger is simply too noisy. ISO 6400 yields a fairly good 5 x 7, with some apparent noise but not too bad. ISO 12,800 makes a nice 4 x 6 inch print, which is not bad since this is still considered a "high" ISO. 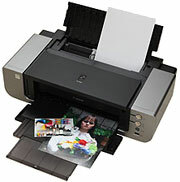 ISO 25,600 does not yield good prints and is best avoided. The Sony NEX-5T does a nice job in the print quality department, yielding sizes we would expect from a 16MP APS-C sensor, and is exceptional at lower ISOs. We were surprised to find however that at default in-camera JPEG noise reduction settings, this camera didn't perform quite as well as the last camera in this line that we tested, the NEX-5N from 2011. From ISO 1600 to ISO 12,800 the NEX-5T scored one print size smaller at each successive ISO setting than did the NEX-5N. Keep in mind that these results will certainly vary for those of you shooting in RAW format and applying your own noise reduction and sharpening in post-processing.